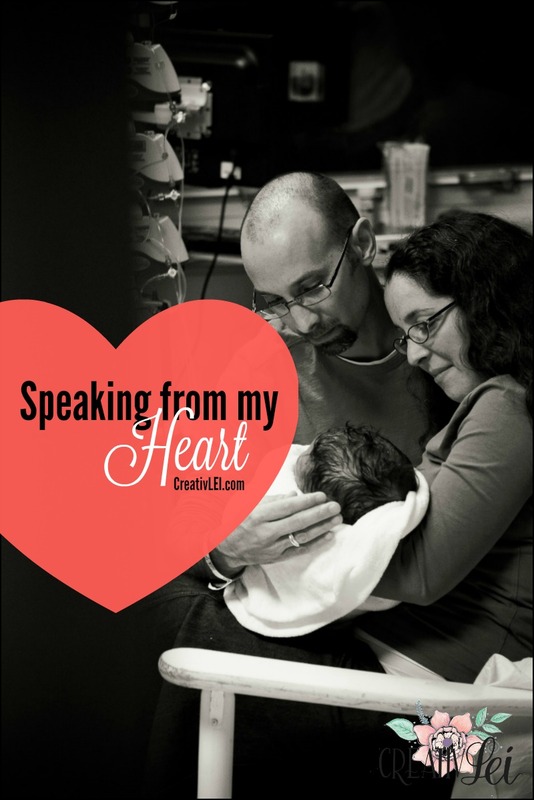 This winter I received an invitation to speak at the annual tribute service that Johns Hopkins holds in connection with the palliative care team. I hesitated for a while. I’m just not comfortable with public speaking. Those of you that know me are laughing because you know exactly how outspoken I am. However, with a microphone in front of me, I can guarantee my face is flushed and my heart is racing. How could I pass up the chance to honor Miranda’s legacy by speaking of how great the impact her short life and too soon death have had on me? I shared on Instagram early that day, to ask that you all would share a prayer or think of me during the time I would be speaking. Some of you asked if I would share my speech with you. Thankfully, I was given a copy of the video of the Tribute Service, and it is my honor to share it with you. *At the :30 mark a card will invite you to view the slideshow. Clicking on that will open it in another window (leaving me speaking in the other window) so you can watch the photos while you listen. Thank you for walking with me through the ups and downs that grief brings. If you have experienced loss, I do hope some of these words brought comfort to you. Are you looking to improve your own penmanship? Do you want to begin calligraphy and creative lettering? Can you commit to a month of FREE lettering videos and tips to help you learn to love your own penmanship and lettering? 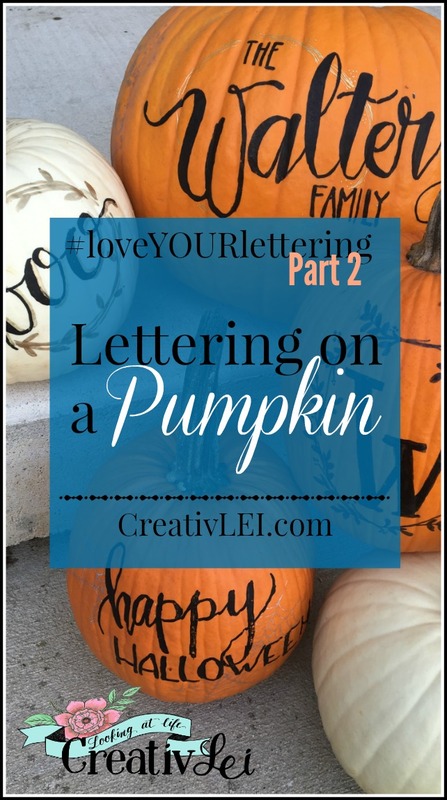 Love Your Lettering was originally written in October of 2015. It is time for an update and now seems like the perfect time for a Love Your Lettering update! The goal for the Love Your Lettering series is not to teach you how to write just like me, but to develop the techniques you need to grow your confidence in your own unique handwriting and lettering style! Whether you are looking to improve your penmanship for writing in your planner, sending out snail mail, taking notes, or you are interested in getting started with basic calligraphy skills and hand-lettering techniques, I can help you! Disclaimer: I’m a left-handed letterer. I also can demonstrate proper grip with my right hand, so I won’t leave the righties stranded. 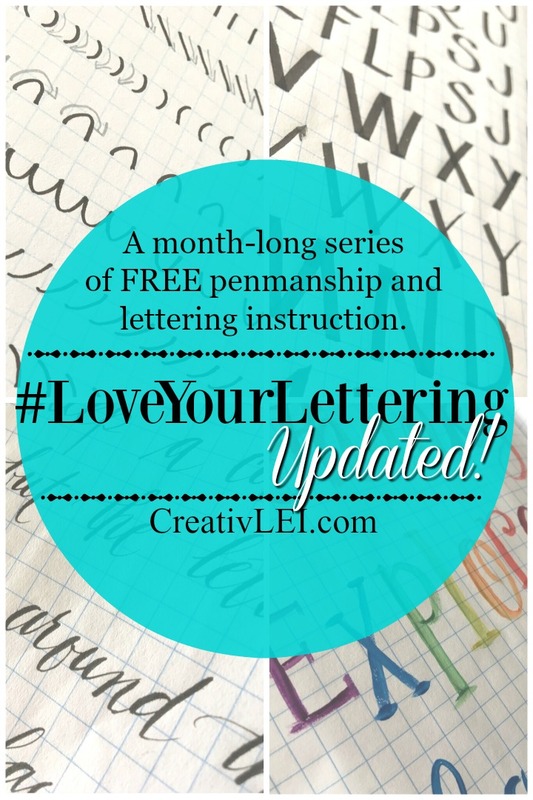 Why is Love YOUR Lettering free? What is the catch? I am committed to giving you quality instruction that truly builds your skills and confidence, this series will give you full access to blog posts and instructional videos that give step by step guidance as well as live broadcasts to help answer your specific lettering and penmanship questions. The series is free because I understand that you may want to purchase the suggested supplies to follow along each week. I don’t want you to choose between having good tools and good instruction, I want you to have both! 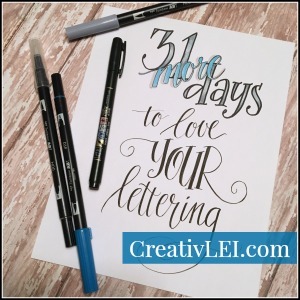 What supplies do you need for Love YOUR Lettering? I want to keep the costs of starting your lettering journey as low as possible without sacrificing quality, because using inferior supplies can be frustrating! The Love YOUR Lettering series progresses through four weeks of introductory lettering techniques and habits. Using a good pencil and/or pen we will look at our natural handwriting, break down the components of proper letter formation, revisit foundational letter forms, and introduce creative aspects of lettering. You will use the same notebook throughout the series. The Rhodia DotPad is my preference because of the paper quality, but a grid/graph composition book is a good start for a tighter budget. A good set of colored pencils are also helpful during this week. Making use of a broad nib (or chisel tip) calligraphy marker we will discuss proper grip and angles for producing basic print and italic calligraphy hands. You will only need one type of calligraphy pen. I will demonstrate using a felt-tip calligraphy pen as well as a Parallel pen. I know this is really why you’re here. Don’t worry, I love brush lettering too. We’ll dive into basic brush lettering and modern calligraphy using brush pens. The Fudenosuke pens receive my highest recommendation for beginning brush lettering. These fine nib brushes help to introduce the variations of pressure between up and down strokes while lettering. We will begin the technique with pencil to practice to help preserve our nibs. During our final week, we take the basics and stretch our boundaries a bit while exploring lettering techniques with watercolor. The Tombow Beginning Brush Lettering Set contains a number of the supplies I’ll use throughout the series. Do you want to receive a daily reminder for the day’s lesson? How will I receive the Love YOUR Lettering assignments? Each day the full instructions will be posted here on the blog along with a YouTube video of technique demonstration (yes, all the old videos are finally being edited). You are welcome to subscribe above, so that you will receive an assignment reminder email Monday-Friday during the month, with a link to the day’s post. Please join the FB group to share your work with others working through the series. You can also ask your lettering questions within the group to help with any techniques that you struggle with. Thursday evenings at 9:30pm (Eastern) I will be live on Periscope for your questions and additional demonstrations. Friday afternoons at 1:00pm (Eastern) I will be live on Facebook for your questions and additional demonstrations. I’m so excited to work through the series with you! If you have any questions about what the month will hold, please email me, comment below, or post your question in our new FB group. You can letter on anything, not just flat surfaces. 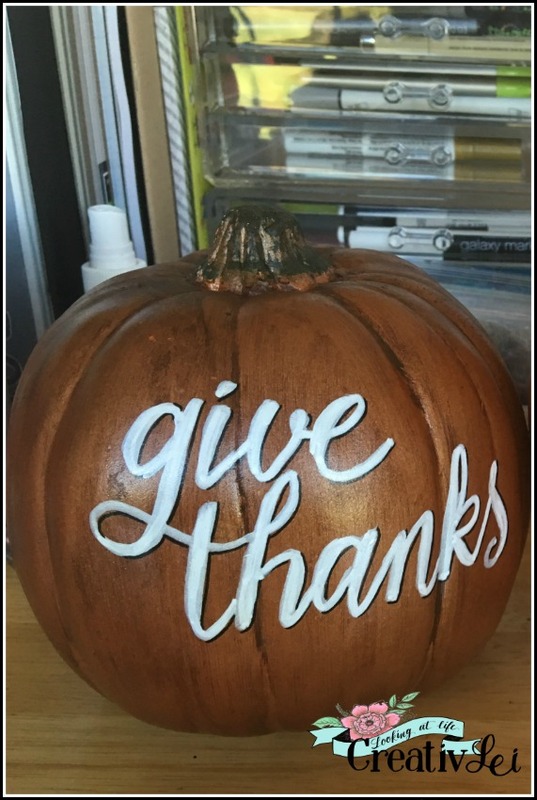 Since it’s October let’s give lettering on a pumpkin a try! Lettering on a flat surface only requires to ability to create letters. When we move to alternative surfaces, like a pumpkin, river rocks, or a glass ball ornament, we need to consider the curves as we lay down our lettering. As a lefty, it also means I need to get creative about keeping my hand out of wet ink! Disclosure: Many of the links used on this site are affiliate and referral links. If you click on and purchase through these links I may make a small commission (sometimes it’s literally pennies, but whatevs). That commission is at no extra expense to you, which is pretty awesome. I value your trust and only link to products I use, love, or am saving up my birthday money to buy. You can read my full disclosure statement for more information. Feel free to ask any question you have regarding these links. Clean your surface to prepare for lettering. Use chalk to plan your lettering design. When I want to be sure my lettering will fit, I sketch out my design in chalk before lettering with the paint pen. While drawing monograms I’m more likely to just put the pen to the surface. I’m wild and crazy like that. Use good paint pens for satisfying results when lettering on alternative surfaces. I prefer the water-based paint pens because the color lays down nice and opaque right from the start. Oil-based pens tend to need a few layers of paint to stand out boldly, and take longer to dry between layers which is not good for a lefty. Add doodles to pull it all together. Simple frames or wreaths, or added doodles like spiderwebs, really help to pull the whole design into a complete look. I like to use a contrasting color with an extra-fine point for these final details. Protect your finished work with a spray coating. 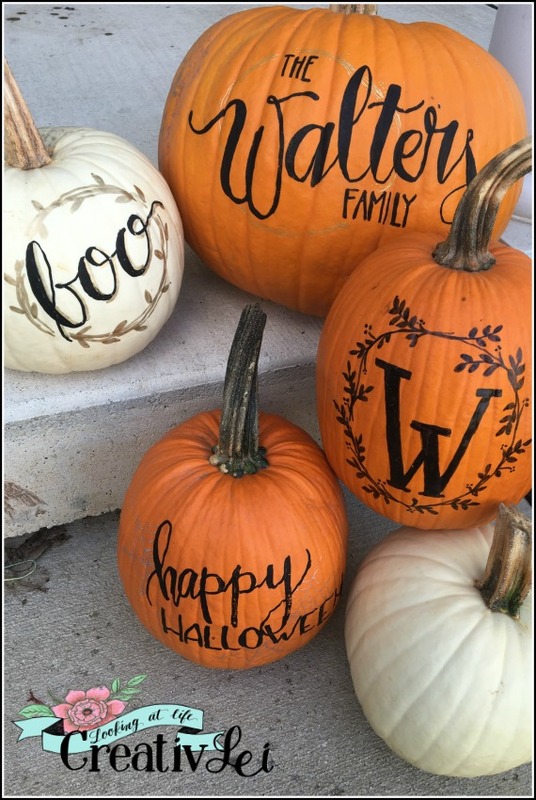 If you are keeping your decor outside, or if they are indoor decorations that you wish to store for another season (NOT fresh pumpkins), spray a thin layer of protective spray paint on your finished work. 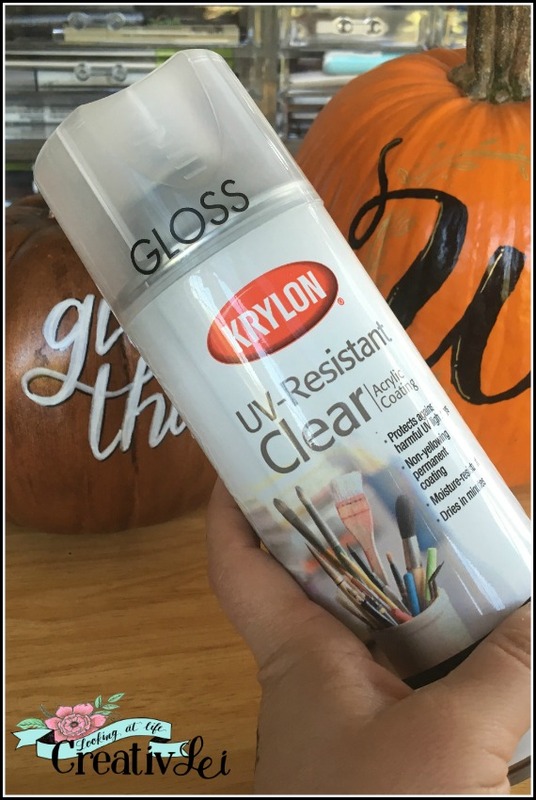 My preference is the clear coat from Krylon. Be sure to spray outside, or in a very well-ventilated area. Another off-the-page lettering option that I love is chalkboards. 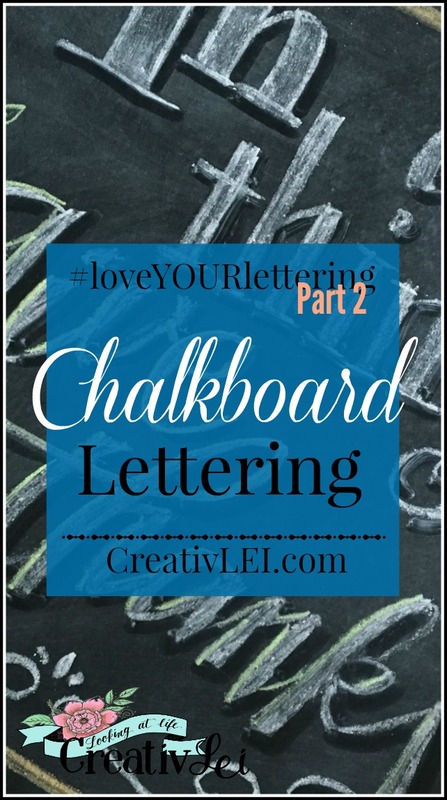 From small frames to large walls, chalkboard lettering is fun, decorative, and purposeful! 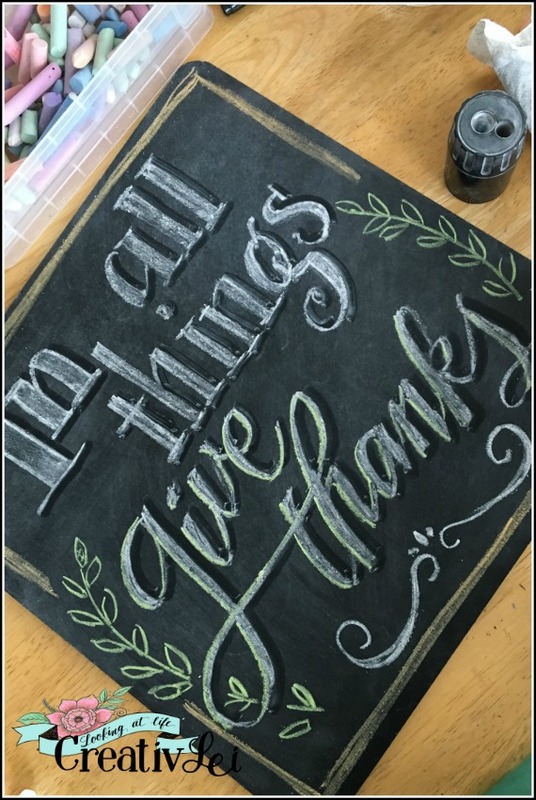 For this project I’m working on a small square chalkboard I found in the Target One Spot (or as I like to call it, the $20 spot, if you know what I mean). These techniques could be applied to bigger pieces and chalkboard painted walls. First you season your chalkboard surface. Why do you have to season the chalkboard? Don’t you want that nice crisp black background? Well, yes and no. You season the surface to avoid any ghosting from old chalk marks. This initial layer of chalk dust gives a good surface to work on without damaging the primary layer of the chalkboard paint finish. Don’t worry about that sharp black background, we’ll talk more about that in a minute. I don’t typically use chalk markers. 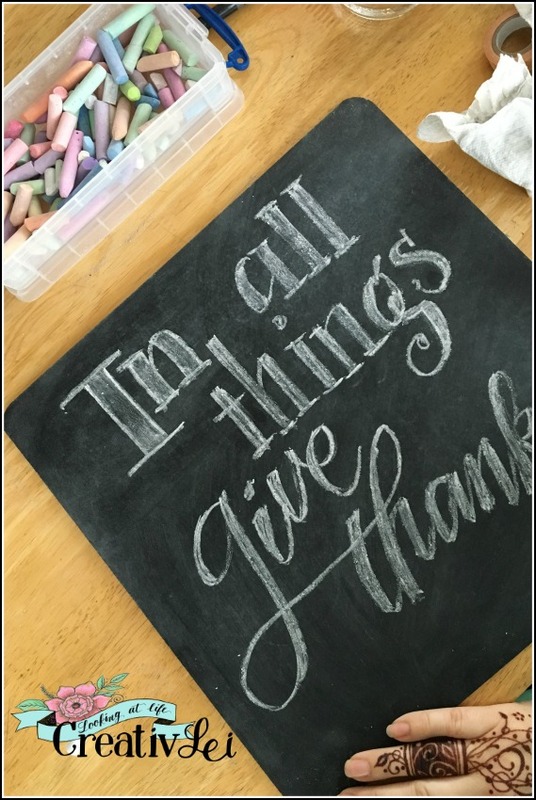 I know some people love chalk markers (wink, wink). They really work well, but I like the satisfaction (and the cheaper palette of lots of colors) of using humble chalk sticks to create art. To create a nice point on blunt craft chalk, I use a pencil sharpener. 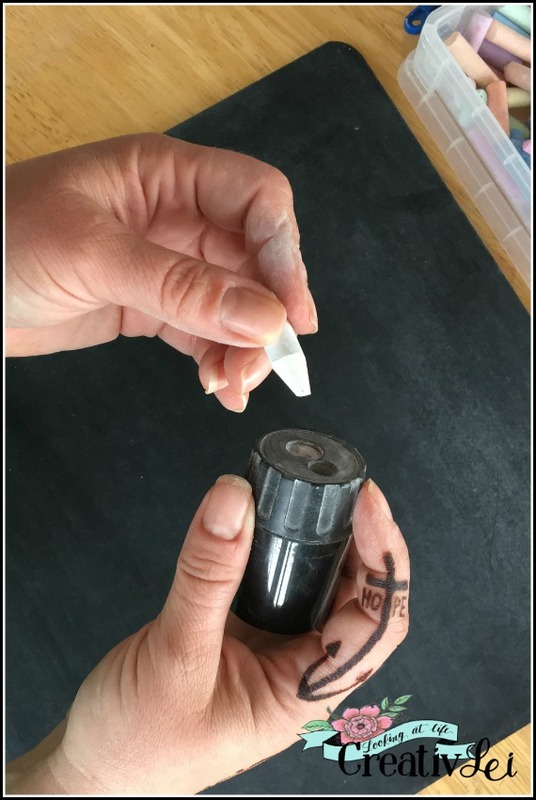 The metal sharpeners that are enclosed in a plastic case work great for this (once you get over the sensory issues of sharpening chalk). Then start sketching out your lettering. Don’t worry if it doesn’t come out the first time. Mine very rarely never does. But, that’s the beauty of chalk. It’s cheap and easy to restart. I work in sections so that I can erase parts that I need to redo while leaving the portions I’m satisfied with. Once I have the lettering the way I like it, I go back with a dampened cotton swab and draw in drop shadows. Now you’ve got that crisp black showing through to make your lettering POP! Add doodles and frames to create a finished look. Simple frames, banners, or doodles really help to complete the piece. Once you start with these small projects, you can apply what you learned to projects much bigger. 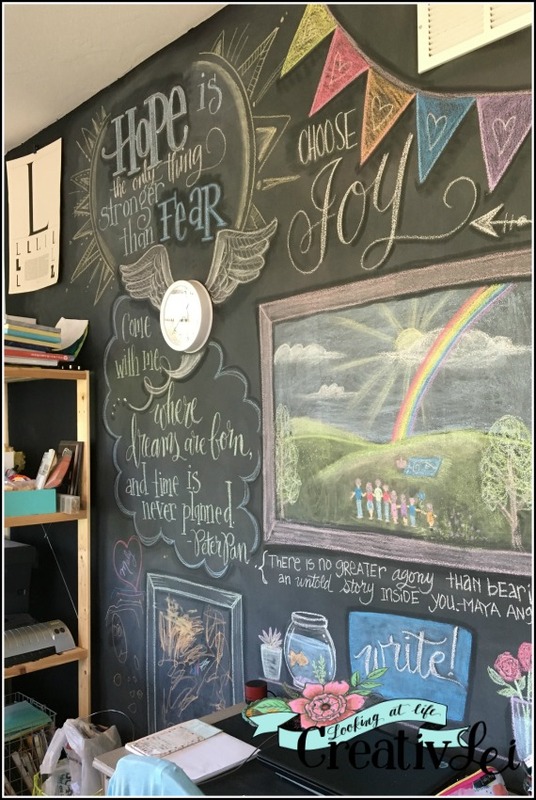 This is the chalk wall of my studio. I only change it out every few months, because once I finally put all the pieces I like together I like to enjoy it for a while. I try to switch it up with the seasons.